New in Theaters for June 8, 2018 "Ocean's 8" and "Hotel Artemis"
I am sorry I haven't been posting for the last few weeks as I am recovering from open heart surgery. I want to thank all of you who have kindly sent me positive wishes and wonderful emails and texts. 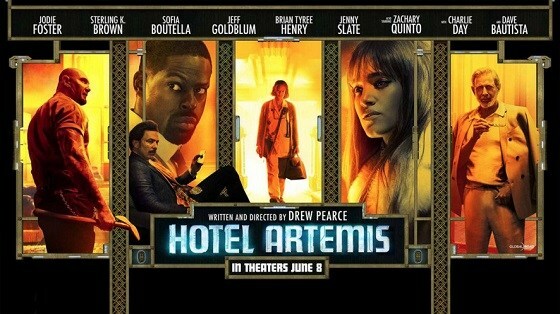 “Hotel Artemis” wants to offer up a slick, edgy and stylized film. The problem there isn't much gong on in the plot for the audience to grab onto. “Hotel Artemis” is told in a clunky vignette style, never coming to the point. The film just meanders around a few disjointed subplots but never lands any solid ground. What the audience is left with is a messy, bland and unfulfilling movie experience. “Hotel Artemis” gets a D and is rated R.
Danny Ocean's sister, Debbie, attempts to pull off the heist of the century at New York City's star-studded annual Met Gala. Her first stop is to assemble the perfect all-female crew. If you're looking for “Ocean's 11,” pass this one by. It never really offers the fun and whimsy of the George Clooney / Brad Pitt series. That being said, on it's own merit, “Ocean's 8” does offer up it's own unique pacing as the ladies take over. After all is said and done, “Oceans 8” is an audience pleaser. A good popcorn summer caper film with enough twists to keep the audience interested.